This Savage Song is a wonderful young adult novel set in a post-apocalyptic America, where the two main characters, August and Kate, must confront monsters, human and otherwise, their own fathers, who happen to be the enemy warlords of their divided city, and themselves, as they are drawn into irrevocable choices by the dark appeal of their own savage natures. But infusing this bleak world is an intense yearning for redemption, to bring good out of evil, beauty out of horror, that lends this book a deeply-felt and wholly remarkable spiritual quality. The pacing is fast, the narrative enthralling, but it is the the depths of the novel--its acuteness of moral imagination and perception--that will stay with you afterwards. My highest recommendation. In this dark urban fantasy from acclaimed author Victoria Schwab, a young woman and a young man must choose whether to become heroes or villains--and friends or enemies--with the future of their homes at stake. There's no such thing as safe in a city at war; a city overrun with monsters.Kate Harker and August Flynn are the heirs to a divided city--a city where the violence has begun to breed actual monsters. All Kate wants is to be as ruthless as her father, who lets the monsters roam free and makes the humans pay for his protection. All August wants is to be human, as good-hearted as his own father, who uses his power to protect the innocent. Thrown together by a crumbling truce and a failed assassination attempt, Kate and August must flee to save themselves. 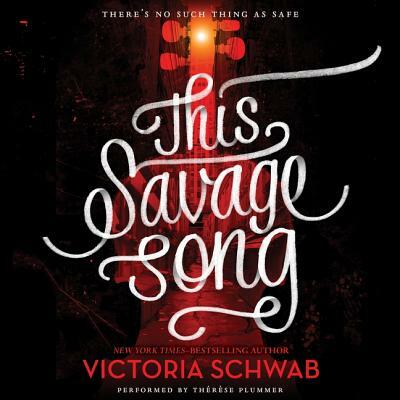 In This Savage Song, Victoria Schwab creates her own dark metropolis, worthy of being compared to Gotham. But it's not superheroes who will save this city--it's two teenagers. This Savage Song begins a two-book saga about finding where we belong, and becoming who we are meant to be.